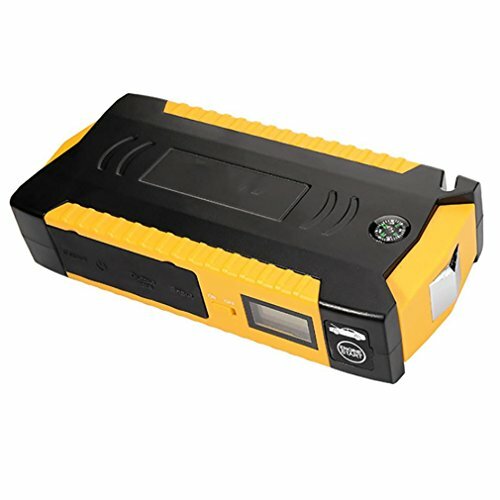 Compact Size & Light Weight: Unlike some big & heavy jump starters, this one is small & light enough to store in the glovebox. Real Life Saver: Jump start your vehicle (up to 6.0L petrol or 3.0L diesel engine) up to 30 times with 600A peak current. New-added Smart USB Charging Port: Intelligently recognize and charge your devices at the fastest speed possible with a inside identification circuit. New-added LCD Screen and Compass: The LCD screen can exactly show the remaining power, output current and voltage. The compass can help you find your way home when get lost in the wild. Adavanced Safety Protection: The high quality and spray gold clamps has over current protection; short circuit protection; overload protection; over-voltage protection; over-charge protection. If you have any questions about this product by Auto emergency starters, contact us by completing and submitting the form below. If you are looking for a specif part number, please include it with your message.